Clothes: all 9 month clothes but he is now too long for his 9 month pajamas. We are switching to 12 month pajamas this week! Grayson is now a speed crawler. He is SO fast! G pulls up on anything and everything. He can now walk while he holds on to things. He loves to walk along the couches, the coffee table, and the entertainment center. Grayson is eating more and more table food. His favorite "real" foods are goldfish and graham crackers! He went to the pool for the first time this month! He would rather play on the steps in the shallow end than swim because he can walk along the wall. Typical. Grayson started his Kindermusik baby music class 2 weeks ago. He is going with his cute friend Ruby & he loves it! It's so cute. We sing, dance, and play instruments. He loves his new instrument! Grayson claps his hands and can give a high 5! Grayson is now taking only 3 bottles a day. He drinks them at 6:30am, 1:30ish, and 7:30pm. He eats 3 solid meals a day and has some snacks in between. Grayson is still a really good eater...we're lucky! We've had no problems adding meat into his diet...he loves pureed chicken. Ick! He also discovered ketchup recently....and LOVES it!! I think he will eat anything if I put ketchup on it. The kid loves his condiments! This boy is so active. I'm afraid we will be busy once he starts walking! Grayson is happy as long as he is doing something that interests him. He crawls all over the place! Long gone are the days of putting him down and knowing that he would stay there. Grayson is a busy boy! Right now his favorite toys are his walker (he is a maniac in that thing! ), any remote, Jack's tennis balls, the dog bowls, his rattle, and his music table toy. Grayson plays hard and sleeps hard. Thank goodness! However, he is an early bird. He sleeps from about 7:30-6:00. At least he is always in a great mood when he wakes up...that makes it a lot easier for me! Grayson's personality is so much fun. This is a great age! I mean, look at that face! Hilarious. I can hardly believe that G has been here for almost as long as he was inside my belly! 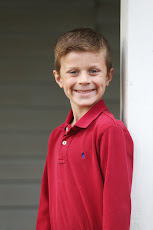 He is growing up so fast and I am trying hard to soak up every second. I know that he won't be a baby for much longer! 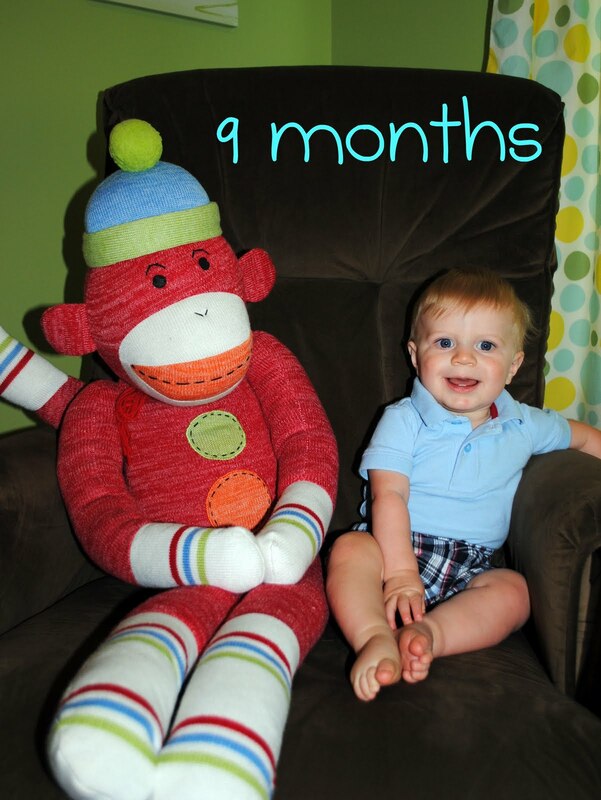 Happy 9 months little G! What a cutie pie! I love all the great expressions. He looks like such a happy guy!